For many years, when anyone asked me to recommend a study Bible, the choice was clear: the NIV Study Bible. Following its publication in 1985, it quickly became the best selling study Bible in the English language. Unlike study Bibles that were the product of one man's scholarship, the NIV Study Bible was the product of a broad representation of the leading evangelical scholars of the day. It was built around the 1984 edition of the New International Version, which had become the #1 selling Bible translation. At 9.75 x 6.75 x 1.75 inches, the NIV Study Bible is a hefty volume, though not as thick or as heavy as the ESV Study Bible. I have carried and preached from the NIV Study Bible for years and have not found it to be too cumbersome. Containing more than 20,000 in-text study notes and a 130-page topical index, the NIV Study Bible covered a range of study interests: character study, archaeology, and personal application. For me it struck the right balance of scholarship and practical commentary. It was a Bible I quickly chose as my favorite Bible for preparing sermons. I had already adopted a preference for the New International Version since the translation first appeared in 1977. One of my professors in seminary, Larry Walker, served on the Committee on Bible Translation, and made sure that we had exposure to the 1977 and 1984 editions. Dr. Walker continues to be a member of the CBT, which is the executive committee for the NIV translation. The Cambridge version of the NIV Study Bible has the trademark NIV cross logo blind stamped on the cover. I am referring to the NIV Study Bible in the past tense because, in 2011, Harper Collins, owners of Zondervan, began publishing a new version of the New International Version--essentially a new translation. The font used for the text is 8.9 points. The notes are a 7 point font, and the references are 5 point. Although I am partial to large (not giant) fonts, I have read the NIV Study Bible regularly for decades; and, even as my eyes have aged, I still find it a pleasure to read. Once the 2011 version was issued, the 1984 copies were either recalled by the publisher or quickly sold out. Fans of the 1984 NIV saw the change coming; and 1984 NIV Bibles (especially the 1984 Study Bible) became collectors items. With the Bible lying open, you can see the red-under-gold hue of the art gilt edges. By 2014, it looked like all the 1984 NIV Bibles were gone. Then Cambridge University Press found a supply in a warehouse and contacted evangelicalbible.com about being the exclusive vendor for this remaining stock. This offered readers one last chance to acquire a copy of the venerable and highly-respected 1984 NIV. The inventory acquired by evangelicalbible.com included four styles: The NIV Study Bible, the NIV Single Column Text Edition, the NIV Wide-Margin Reference Edition, and the Pitt Minion Edition. This review is only going to cover the two styles I own. First, the NIV Study Bible: Evangelicalbible.com has copies of the NIV Study Bible in black and burgundy goatskin. 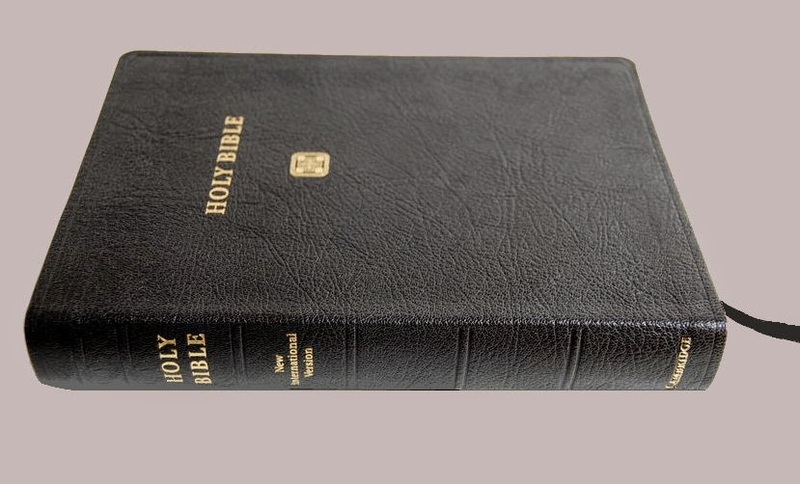 If you have never handled a Cambridge goatskin Bible, you have missed a delightful experience--soft, supple, while, at the same time, the most durable Bible cover you can buy. The Cambridge goatskin NIV Study Bible has other deluxe features: art gilt edges with red die infused under gold gilding. This gives the Bible's edges a gold appearance when it is closed and a reddish hue showing through the gold when opened. This not only gives the Bible an aesthetic appeal that is a notch above typical gold gilding, it adds a layer of protection to the page edges. The Smyth-sewn binding means the Bible pages are sewn into the binding in a way that provides greater durability while allowing the Bible to lie flat when opened. NIV Single Column Text Bible. Just as the NIV Study Bible remains my favorite study Bible, this single column text edition remains my favorite Bible for reading. The text runs across the page just like a novel. The typeface, 10 point Palatino, is easy to read. This edition is in calfskin, not as supple as the goatskin on the Study Bible, but a delight to hold, nevertheless. The NIV Single Column Text Bible uses line matching, which reduces ghosting--show-through from the text on the opposite side of the page. You can see that in poetic sections, like the example above, there is quite a bit of room for ghosting. Even in prose sections (as in the photo below) there is still ghosting everywhere there is not text on both sides of the page. Some readers have expressed their dissatisfaction with the amount of ghosting in the NIV Single Column Text Bible. However, it seems more noticeable in these photos than it does in real life (at least in my experience). I am ordinarily one of those who is bothered by ghosting, but have not found it to be a problem in this edition. Evangelicalbible.com has one other binding of the NIV Single Column Text Edition worth mentioning, a tan imitation leather version. I had purchased two of these a couple of years ago, when it looked like I would never see a black goatskin or calfskin edition for sale, intending to have one of them rebound in leather or goatskin. I still haven't gotten around to rebinding it but will report in a future post how it turns out when I do. The imitation leather version comes with regular gold gilded edges rather than the art gilt edges of its more expensive calfskin and goatskin siblings. The binding is still Smyth-sewn and the paper printing quality are the same. I can report that the imitation leather is very supple--in fact, as supple as the genuine article. Now, thanks to Cambridge University Press and Evangelicalbible.com, I have a genuine calfskin in my collection. Pitt Minion and Wide Margin versions. The Cambridge Press treasure trove being sold by Evangelicalbible.com also contains Wide Margin and Pitt Minion versions. I am not reviewing those versions here. However, people who prefer either wide margin or compact Pitt Minion editions will want to check out those offerings from evangelicalbible.com. If you like compact Bibles and you haven't tried a Cambridge Pitt Minion, you owe it to yourself to do so. Hi. I was just wondering how you managed to get hold of the single column in genuine calfskin? I've been trying to source one but it seems to be impossible! Many thanks. evangelicalbible.com sold out of the single column in calfskin literally a few hours before I was going to buy one. Fortunately, a fellow who bought one of the last remaining copies from evangelicalbible.com resold it on E-Bay a couple of days later, and I got mine from there. I know it originally came from evangelicalbible.com because it still had their business card tucked inside. I wish you success in finding one. If you do not, an alternative might be to buy one of the tan, imitation leather editions and to have it rebound. Leonard's Bookbinding in Indiana does a good job. It won't have the exact same look as the Cambridge, but it will look very good and be comfortable in your hand. Bradford do you still have any of the black calfskin NIV 1984 Cambridge single column Bibles for sale? all your 1984 NIV single column bibles are defected and have a printing error in Thes4:9. It is missing the words "for you". I am seeking a 1984 NIV bible. Please help. I am seeking a 1984 NIV bible as well and so far, have had no luck. Yes we have some NIV Cambridge Bibles. Just go to ebay and put in search Cambridge NIV 1984 Bibles. My ebay ID is bhac5620.